A month ago I was looking for a multitimbral chiptune synth and now I’ve just seen this project on a french news website and I wanted to share it! It looks pretty nice and it’s not too expensive. (I’m not affiliated although I did back the project). 4 Part Multitimbral- perfect companion for the Digitone. Minimal and to the point. Sounds great. I haven’t backed a kickstarter in a long time, I might make an exception for this. Yeah I found it was nice, plus you can select the engine for each voice, meaning you can have for example 4 times the noise, but with different FX. I think it can compliment a Digitakt/Digitone pretty well! As for myself I have a Digitakt and an Analog Four MKII so only 4 midi tracks busy on the Digitakt. This will take care of the four others! There are all the Twisted Electron synths which are nice but pretty self contained. So this is a cool addition! Well, I have to say that I’m really impressed with this. You’re spot on with the thought that it would compliment the DT/DN very well. I was initially thinking that the synth engine was maybe a little too simple but then reading the manual and watching the videos I realised that you can get quite the range of timbres from it. The multiple variations of each osc type that have a definite character but with subtle differences will lend itself to some quite interesting sounds when controlled with midi CCs. I also realised that it’s more flexible than the likes of the HappiNES L from Twisted Electrons at roughly two thirds the price. I was looking at the Fred’s Lab website and it seems that he’s been involved in Arturia Minibrute, Waldorf Pulse2 and NW1 module. It also looks like there might be a prototype of the Arturia Microfreak on the bench behind him in one of the videos so I guess he knows what he’s doing. The midi implementation is already very thorough! Can’t wait to p-lock this thing! Absolutely!! I think pretty much everything is covered with the CC’s. I also liked that in his update message today he confirmed how the CC resolution is interpolated so that there isn’t any stepping. Seems to be a good start to the Kickstarter campaign and hopefully he’ll have a decent flow of information videos and sound examples as I find that’s always helpful in getting more people on board after the initial rush of backers. Really hoping it gets funded. I am Fred, the dev. behind the Buzzzy! Thank you very much for all these positive comments. I am there to answer all the questions you may have about this machine. Please feel free to ask! Hi Fred, good to see you’ve dropped by. Really looking forward to this and hope it makes it targets. I’ve a quick question about the LFO’s. 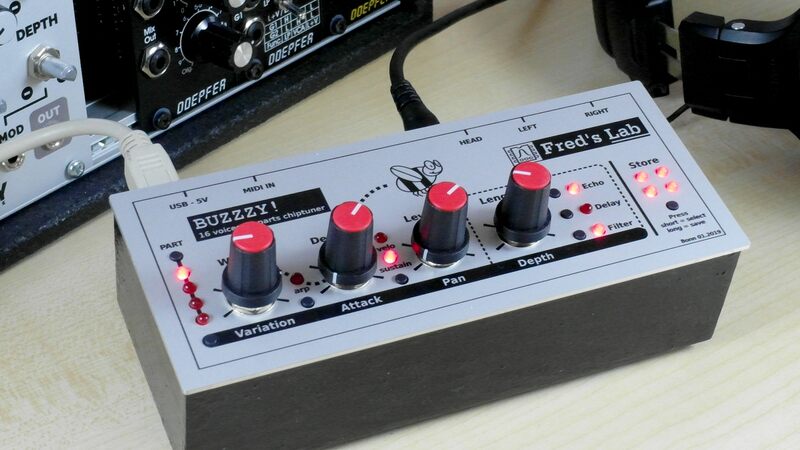 You mention in the FAQs on the Kickstarter page that the LFO’s affect a variety of parameters based on the algorithm selected. Can you say a little more about what these are doing? And is there any scope to make these accessible via midi CC? It would be great to be able to change depth, speed and shape… a random LFO shape would be good too. Sounds good to me as well and I backed it, since I am a sucker for small/tiny/portable synths. I guess it might be also a great companion for an Op-Z. Good question @jeye_musik, would be interested in knowing that as well. Still one quarter of funding goal to go…crossing fingers @marzac! Can you say a little more about what these are doing? And is there any scope to make these accessible via midi CC? It would be great to be able to change depth, speed and shape… a random LFO shape would be good too. Hopefully they will come sooner but better surprise backers in that way.